From this I learned that perfumery is alchemical and from sweet things horrendous smells can emerge and vice versa. (For example, sweet musk was originally derived from unpleasant substances in the gland of a range of animals including the musk deer, the musk rat, the musk duck and even the crocodile, where you’ll find it nestled away in the cloaca.) 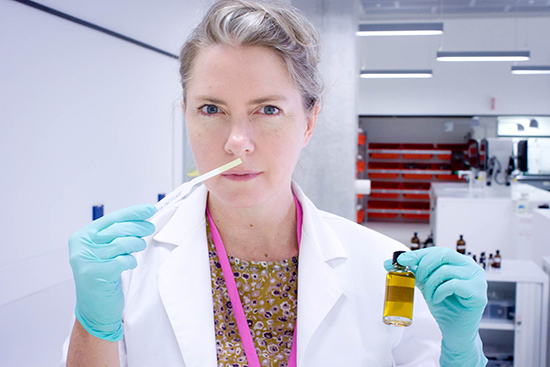 Artist turned conceptual perfumer Cat Jones has been dabbling in this mysterious art for a while now and, at the invitation of the Sydney Festival, will be exploring the scents, both sweet and rank, that might be distilled from this big, bad, beautiful, mixed blessing of a city called Sydney. 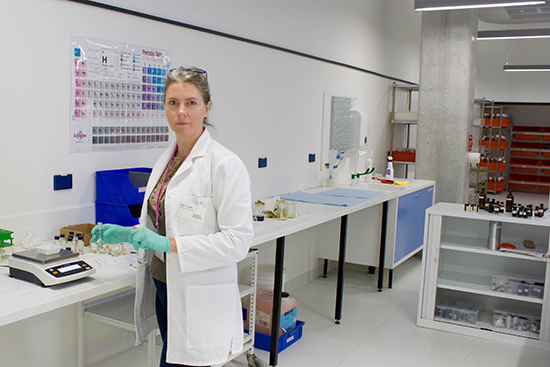 Olfactory elements have been present in Jones’ previous works Somatic Drifts and Anatomy’s Confection, but it was not until Port Adelaide’s Vitalstatistix commissioned her to create a work in 2015 for their Climate Century project that scent became the central element, materially and thematically. Jones’ Century’s Breath responds to the site of the LeFevre Peninsula in South Australia which is called, in the language of the Kaurna people, Mudlhannga, and translates as “the nose place.” Through conversations with locals, peers and passersby the artist gathered visions of the future, more specifically “olfactory portraits” of it. She explains the process: “Each person has their story documented and describes the smell of the idea or the place or the habitat and gives it a title…I act as a verbatim scribe with a few tweaks. So it comes in forms that are either prose or poetry or block words—the writing form changes because everyone expresses themselves in a different way.” The resulting installation took place at the South Australian Maritime Museum and contained a series of smellable “olfactory landscapes” and “commemorative perfumes,” along with brief text evocations that include the scent concept, the aroma description and the materials used to create the smell. The work won the Sadakichi Award for Experimental Work With Scent in the Art and Olfaction Awards 2016 presented at the Hammer Museum, Los Angeles. While scent is the carrier, conversation is definitely the key to this work and Cat Jones’ relational art practice. During our interview, she deftly manages to turn the tables and I find myself a participant in the kind of discussion in which a visitor to the space might find themselves. Through gentle interrogation I am encouraged to concoct a conceptual fragrance called “Grinding through to Green,” that smells of grinding metal and human sweat with an after-tang of dusty city greenery, that describes my feelings about Democracy in this currently Baird-bullied city. My conversation joins those of other audience members to be compiled into an online archive for wider access. But don’t expect to come home with your own sample swatch of Sydney’s Democracy or Competition or Landscape. Resisting the demand for takeaways is partly an environmental consideration, but Jones is also hoping to slow participants down so they can “immerse themselves in each scent and the conversation it came from…They will verbalise the experience, describing it rather than just saying, ‘Here, smell this’.” This, in addition to a comprehensive public talks program confirms that for Cat Jones, Scent of Sydney really is all about dialogue and communication, which is timely because in this corporate capital-driven city, where culture fights for every waft of sweet air, there’s a lot we need to talk about. You can buy the limited edition scent Radical Ecologies from the work Somatic Drifts here and samples and the boxed book set from Century’s Breath here.